For a costuming like myself, who doesn’t sew, the abundance of ready to wear steampunkable faux military jackets is a god send. I have been seeing and buying them all over, from Target to Nordstrom’s. For the purposes of steampunk ensembles, we are looking for jackets that are either Victorian/Edwardian or purely fantasy. I’m not a historical costumer, so the jackets I pick up are usually going to end up being airship or submersible captains or crew. As the age of steam generally ends with the rise of diesel, world war one is generally accepted as the end of steampunk, so you want to avoid uniforms that look more modern. Lately though, I’ve been seeing a lot of unacceptable jackets hitting the market. I thought I’d share with you a few tips that I go by when buying jackets. Material. The jackets made out of sweatshirt material really just don’t say steampunk. They say “ I picked up whatever was on the floor of the dorm room”. You could wear one to slightly steam up an everyday wardrobe, but all out steampunk requires better fabric. Also, denim, can be tricky. Yes, denim existed, but it was not widely used and definitely not by the military, especially pale blue denim. Another reason for nice fabric is structure. You are looking for garments with tailoring and style. A heavy cotton will look nicer for our purposes. If the jacket has a cloth tie at the waist, take it off and dispose of it post haste. It looks dreadful. Replace it with a nice leather belt of the proper size or remove the belt loops if need be. The trenchcoat is often mistaken for military, but it is too modern for our purposes. Pass it up. When deciding on color, the olive drab that many of them come in is simply too modern and camouflage is right out. If the green is light enough, and you really like the styling, I would suggest dying it. If it’s not synthetic this should be easily done. Do remove the buttons first and reattach them after dying so as not to damage the finish, unless you want them damaged. Try a shade of brown, burgundy or even purple. Black or an emerald green would also work. Not only will this fix the drab green problem, but you will have a much more individual garment when you are done. On the topic of buttons, I will often replace the buttons on a jacket if they are not shiny brass or interesting. Large plastic buttons just don’t say steampunk. I recently exchanged the cloth covered buttons on a cropped corduroy jacket for brass domed buttons and it looks much sharper. If you have enough buttons, you may add some at the cuffs for a more interesting look. And epaulets, which look very dapper, will often have buttons giving you another area to add sparkle. Also, avoid zippers when choosing a jacket. Zippers just scream modern. You can add hook and eye closures or a nice double ended clip to hold it closed if need be. One way to jazz up your jacket is to add a faux medal or two. You can find some of these faux medals in stores currently, or try your hand at making some. Craft stores have a lot of fun things to utilize these days. I’d caution you not to use actual military medals unless you earned them because it is quite disrespectful to those who did. Patches can also add an interesting touch, and can be found in craft stores. So, do search for a military jacket or two for your steampunk wardrobe, but keep my tips in mind for maximum steampunk style. At ease. 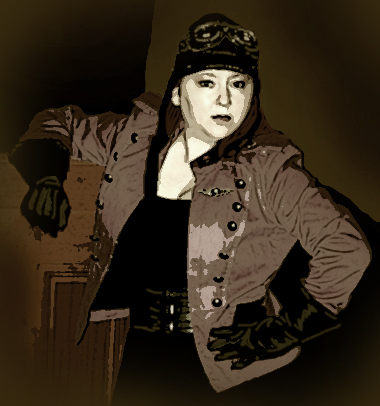 I am an illustrator, writer, costumer and steampunk enthusiast. I have done illustration for comic books, animation and collectible card games such as Magic the Gathering and Legend of the Five Rings. Currently, I do art for my own line of cards and gifts in my Zazzle shop.